What to post on open data portals? Let me Google, er, Bing that for you. | Data, etc. The first two follow a different work path. For the last item, there is a great free, open-source tool which helps you identify Excel and other documents currently posted to a government website. Let Me Get That Data For You (lmgtdfy) leverages Microsoft Bing to find Excel, JSON, comma-separated (CSV), Shapefiles, and other documents that could be posted to the data portal. Visit the website to enter a URL, which scans all the websites (the entire domain) and subdomains for the applicable file types. You can browse the results to see if there are any files currently posted that can be posted on the portal. Below, a scan of www.cityofchicago.org shows some results. After further inspection, many of these files are “forms” in Excel and not a good fit for the open data portal. However, there are some promising leads for our team. This also a useful on-going strategy for mature data portals. Sometimes, data gets posted to a website without talking to the open data portal team. C’est la vie. Check this quarterly to try to capture any of these “mistakes”. Careful, though, if you already have a data portal. lmgtdfy will return the results from the portal as well. So, Excel and CSV files available on your data.city.gov (data portals are often on a subdomain) will also show up. To avoid this, enter www.city.gov to avoid those results. This strategy has some limitations. The primary mission of open data is to provide data in a machine-readable format, and Excel documents do qualify as machine readable. To that extent, it’s a relatively small win. But it does help you consolidate your data onto a data portal instead of documents across a sprawling government site. Portals also provide a quick way for users to visualize data–instead of opening in Excel–or for programmers to use an API. 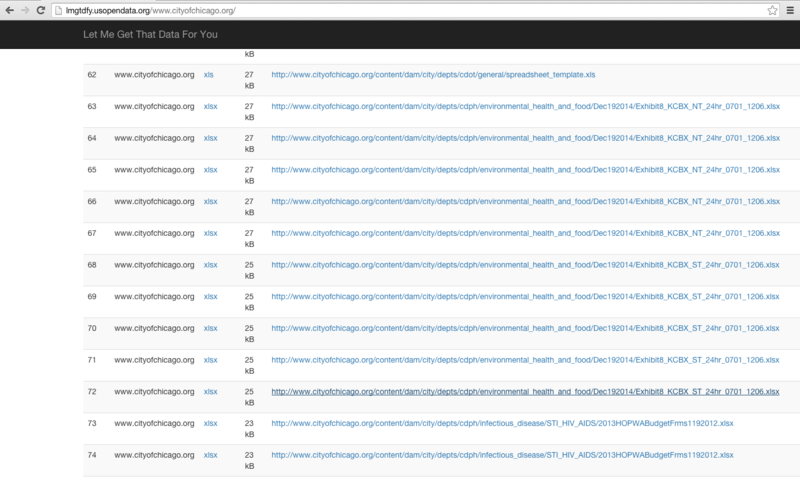 lmgtdfy is a good way to get the quick wins to get data onto the data portal. Combine it with some other strategies and one or two big items in the early months to get a big win. This entry was posted in Open Government and tagged data portal, lmgtdfy, open data. Bookmark the permalink.